This spring, as most districts were preparing to end the school year, Clemson was focused on helping minority students who too often never make it to graduation day. 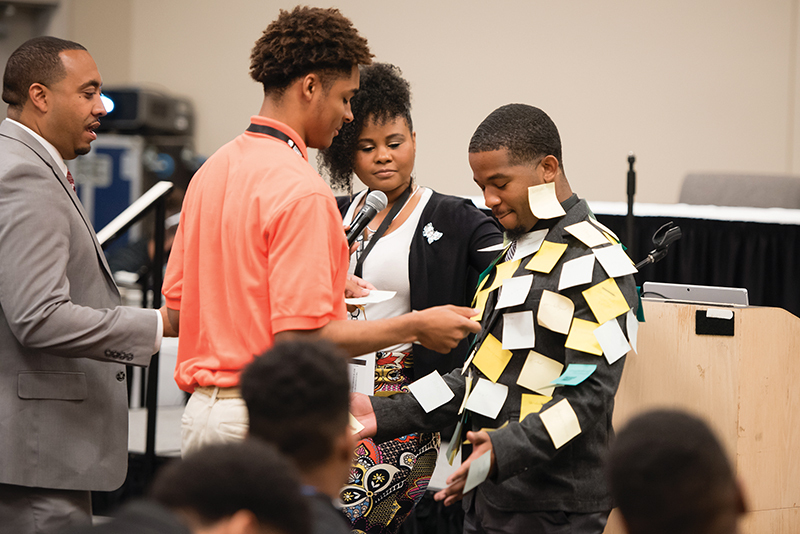 Clemson’s inaugural Men of Color National Summit was held in late April at the TD Convention Center in Greenville. The summit’s mission is to close the achievement gap for African-American and Hispanic males, who trail other demographic groups in high school graduation and college enrollment rates. This now-annual event will benefit students and their communities by identifying and promoting strategies that foster success from cradle to career. Educators, business professionals, advocates and community leaders from 27 states attended. At the heart of the event is the Tiger Alliance — a cohort of 325 ninth through 11th-grade students from the Upstate and I-95 corridor. The 2017-18 Tiger Alliance cohort’s experience at the summit included meeting inspiring role models and attending workshops that emphasized proven, real-life skills. The summit enjoyed strong support from the Upstate, including presenting sponsors, the city of Greenville and Greenville County. The nationally syndicated “Tom Joyner Morning Show” broadcast live from the summit. In addition to 30 breakout session speakers, high-profile keynotes included Tavis Smiley, host of the PBS talk show “Tavis Smiley” and PRI’s “The Tavis Smiley Show”; John Quiñones, journalist and host of the ABC newsmagazine “What Would You Do?”; Desmond Howard, Heisman Trophy winner and ESPN college football analyst; Roy Jones, executive director of Clemson’s Call Me MISTER® program; Marc H. Morial, president and CEO of the National Urban League; and David J. Johns, former executive director of the White House Initiative on Educational Excellence for African-Americans. With the support of Clemson President James P. Clements, the event was spearheaded by Lee A. Gill, Clemson’s chief diversity officer and special assistant to the president for inclusive excellence. Gill gives the lion’s share of the credit to co-chairs Chuck Knepfle, associate vice president for enrollment management, and Julio Hernandez, associate director for Hispanic outreach, as well as a host of dedicated staff and volunteers. A 20-year higher education veteran, Gill came to Clemson in 2016 from the University of Akron, where he had led the Black Male Summit for nine years. He hailed the first Clemson summit as a huge success. Confirmed keynotes for the 2018 summit include Roland Martin, Michael Eric Dyson and Marc Lamont Hill.